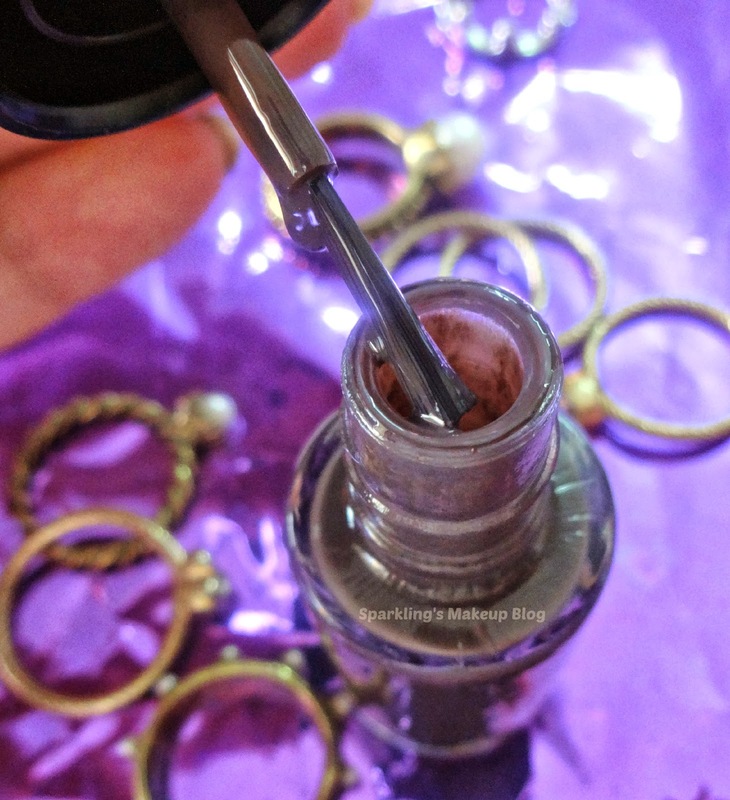 I was in Love with MNY's Color Show "Midnight Taupe" even before I swatched it... Yes for the NAME-SAKE. So was it worth it? To Reveal More Read More!!! 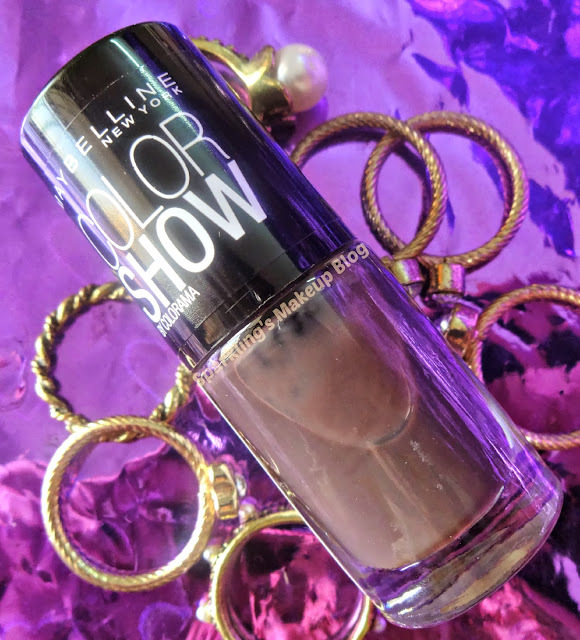 Let me confess, I fell in love with the name, even before I swatched the shade on my nails. I knew its going to be a good shade. It seemed to be a dark shade, "Taupe" in the name said it all. 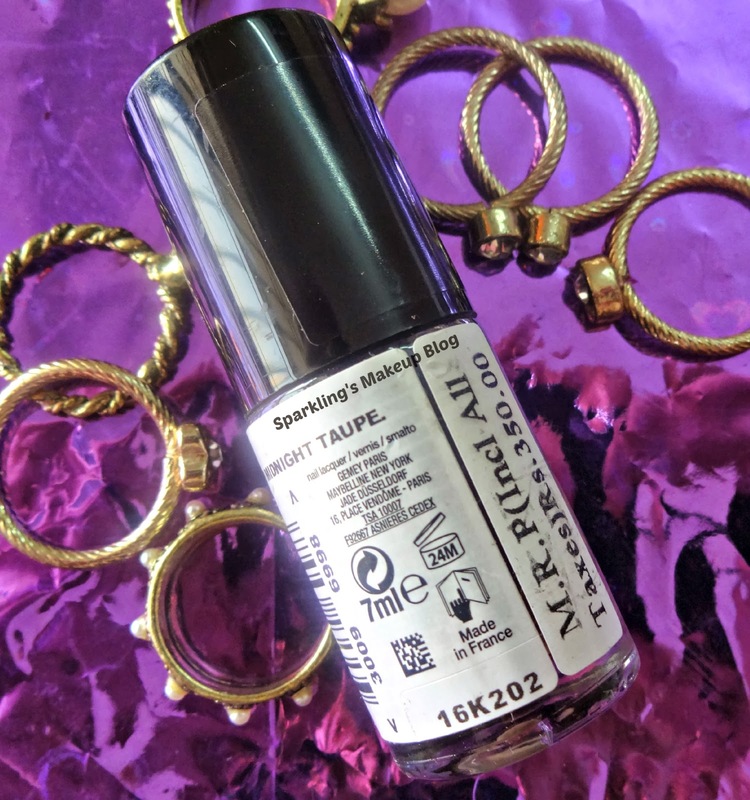 The moment I swatched it my love strengthened, this is such a beauty, I knew I want this for the Coming Winters, I love wearing dark shades on my nails in Winter. I like to wear Black or Dark blues and even red for Winters. This is my new "Black". I am dreaming of the days I will be sipping my HOT Coffee, wearing a shawl and darkest grey jumper/sweater and Midnight Taupe on my nails. Can't tell you how I long for Winters and all those silent gloomy evenings and long nights. Much said about the shade, let's review its consistency. 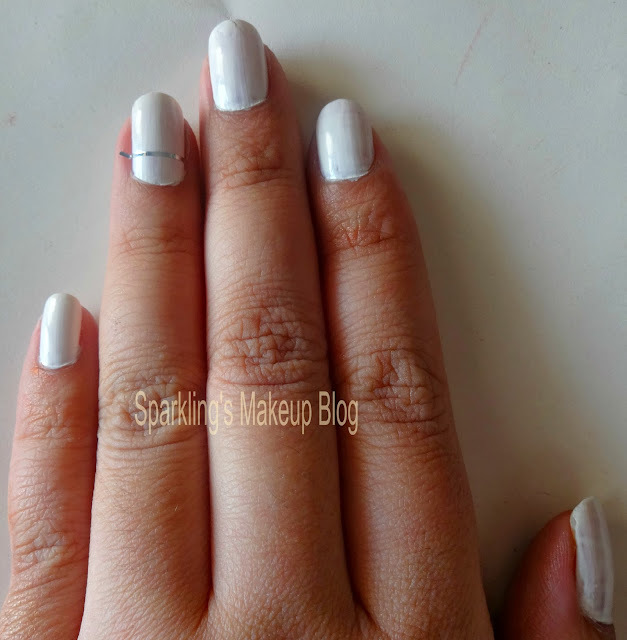 Its consistency is normal, as required for easy spreading of the shade on the nails. The brush is of normal size. Its pigmentation is good but if you want it all opaque u'll need two coats at least. It is matte, but lustrous so no need of a top coat to make it shine. Well I love it. One more thing I want to share, "Taupe", French name for "MOLE" is a dark brownish grey. 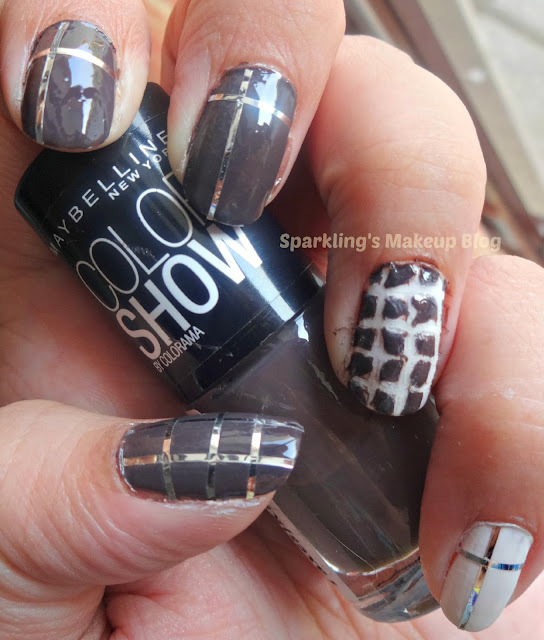 When first time I had it on my nails, it reminded me of my Oil-painting days, no! not due to scent but when I finished a painting, I used to mix all the shades on my palette, including Ochres, browns, reds, blues and all, and they all made a colour similar to this one,, which I loved and used for the shadows in my paintings... "Woh beetey din yaad haen!!!" In Pakistan it is available nationwide, 7 ml for Pkr 350. Online check at Just4Girl.pk and Beauty Arena. 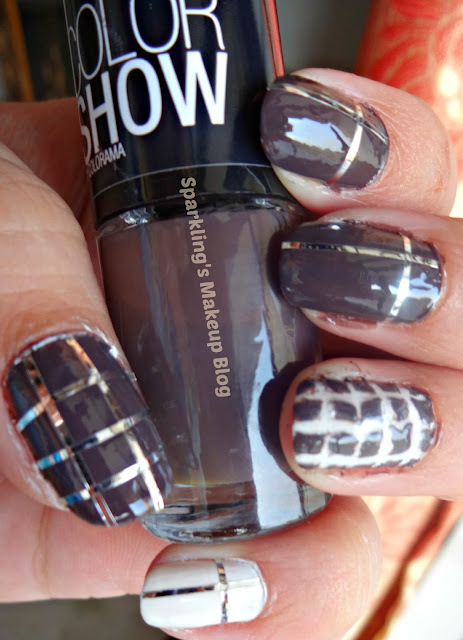 Have a look at the swatches and a Nail Art I did by using this beauty of a shade. 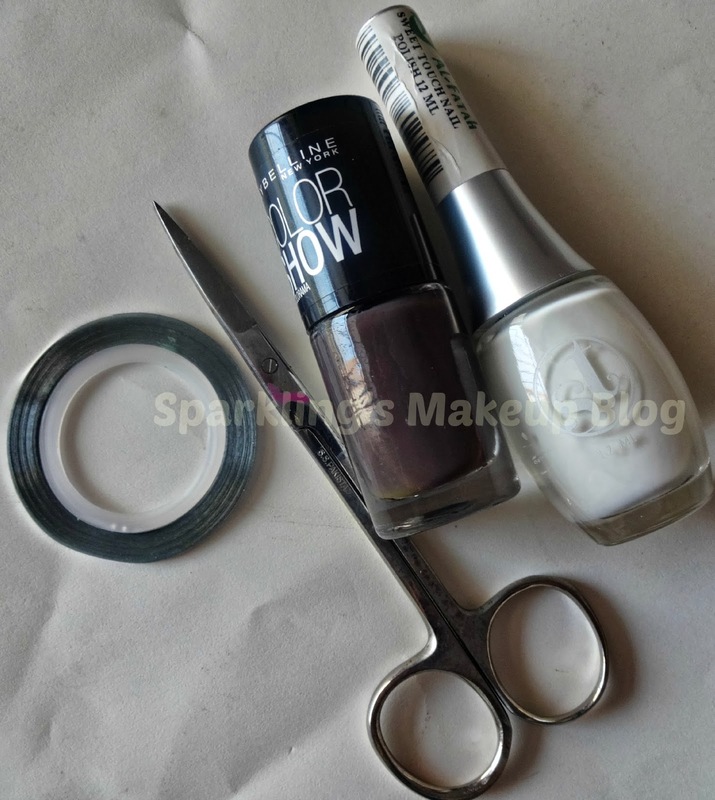 Paint all your nails white, two coats, full opaque and completely dried. 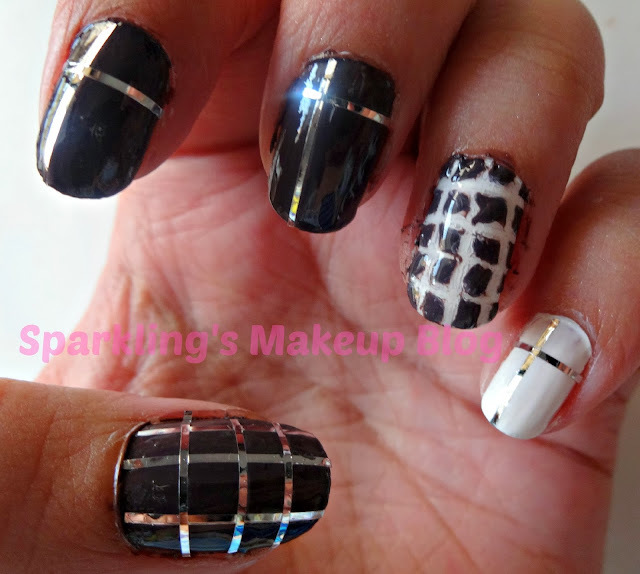 Apply horizontal striping tapes on one of the nails. I chose my ring finger for this. 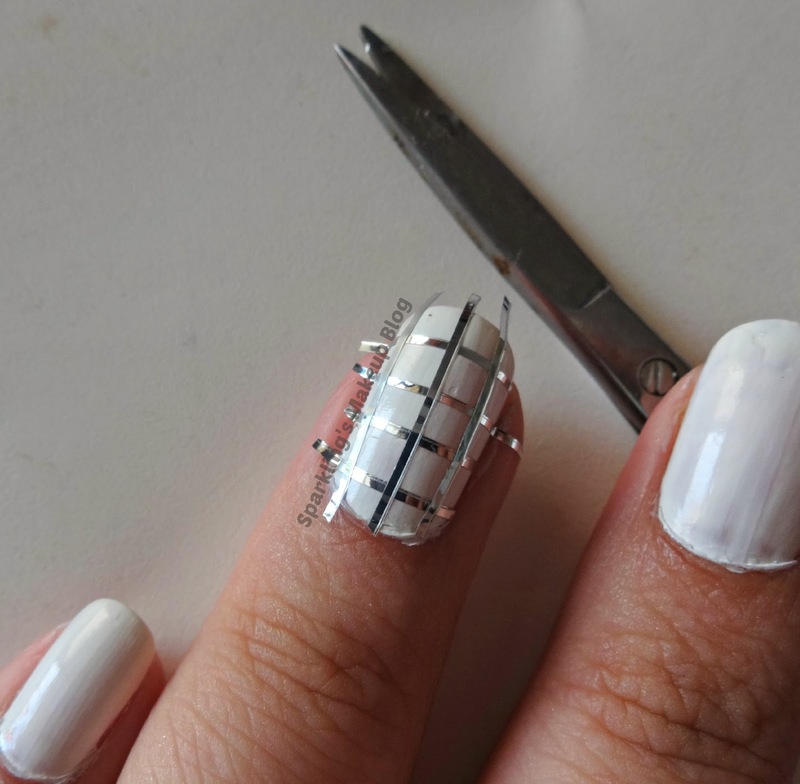 Now apply the striping tape vertical. Apply Midnight Taupe over the striping tape. 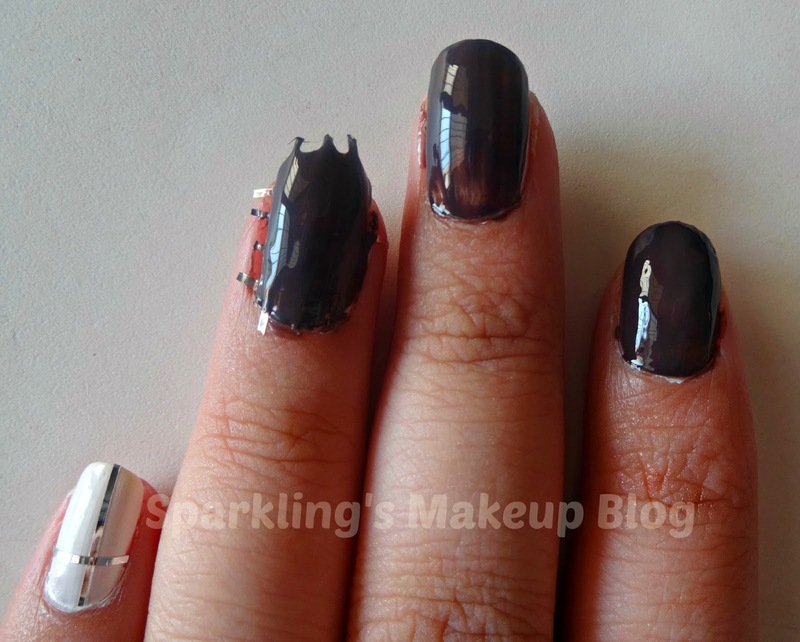 I also painted my first two fingers with this dark shade. 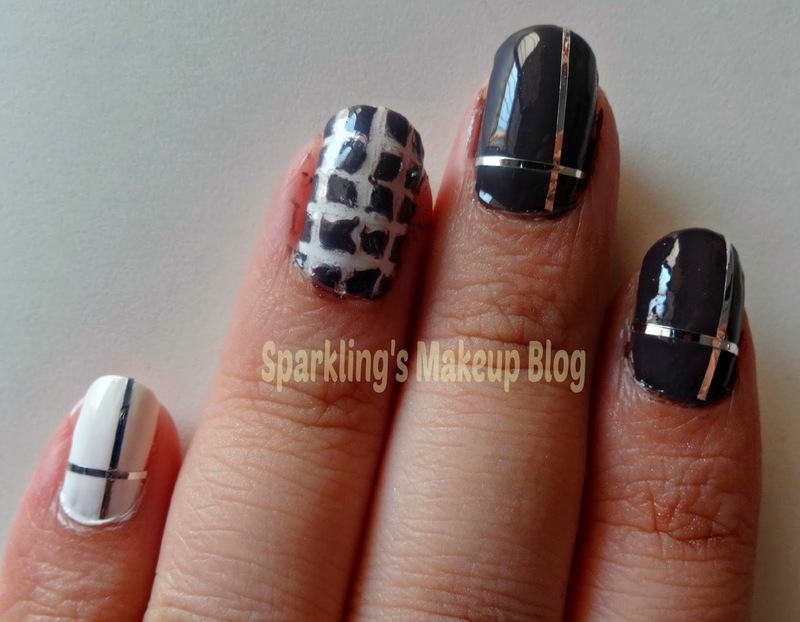 On my small finger I applied Silver striping tape one line vertical and one horizontal. After removing all the striping tapes form my ring finger I applied two lines of the tape on my first two nails. 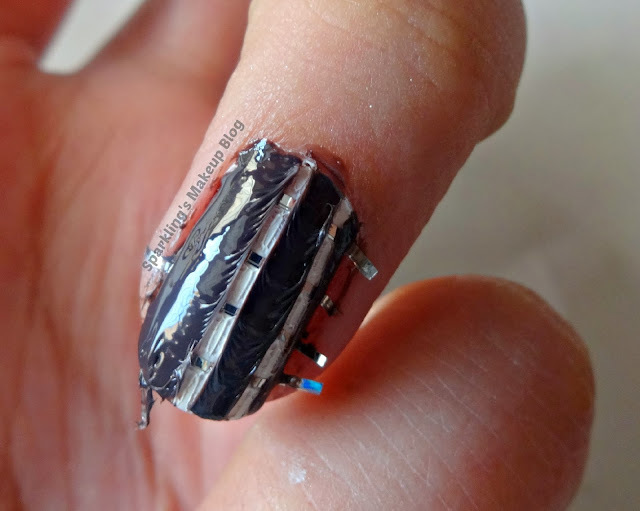 On my thumb I applied the striping tapes horizontal and vertical. Sealed it all with a top coat. 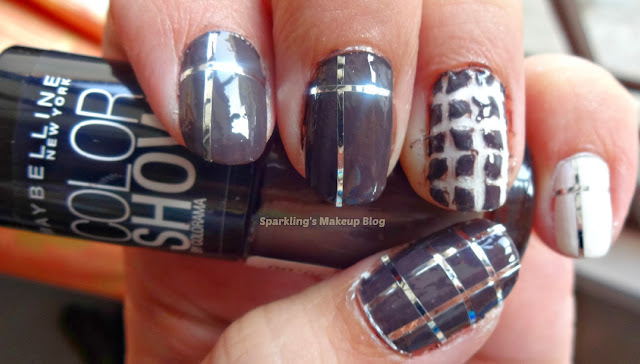 Hope you'd like this MNY "Midnight Taupe" review and Nail Art post. Do share your views, comment, share, like, tweet, G+ and Pin IT. 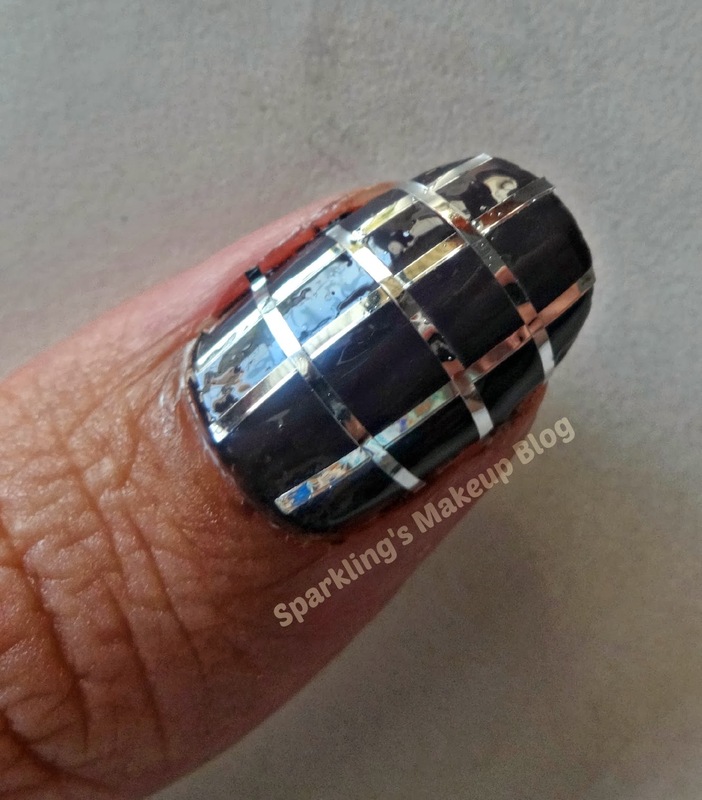 Do read other Sparkling posts on Maybelline.